Social Wi-Fi Marketing and Hotspot Monetization, Data Mining, Premium Internet & Analytic. If you offer Free Public Wi-Fi to your customers, it’s considered a standard service that provides basic access, and never really makes full use of the potential of the network. Customers want free reliable Wi-Fi to enhance their experience, to connect to their family, to work remotely, to compare prices online. Successful large Wi-Fi networks are complex projects that require careful planning and can include significant costs. Our promise is to help you with your Wi-Fi challenges. From now on and forever. Every day is a new opportunity. Inspire guests when they sign-in for Wi-Fi access. Use our global experience and leave all potential failures behind thanks to our proven expertise. Your Public Wi-Fi. Your Treasure. This revenue stream allows you to capitalize on the multimedia space of your network for commercial and advertising partnerships. Brand Awareness is always at the top of the list of social media marketing goals. Brand Awareness is a direct result of social reach, engagement, influence and social presence. SOCIFI is turning Wi-Fi into a valuable business enabler. Interact with your visitors and use the data for new marketing purposes. Collect feedback from your customers effectively. We provide you with a great tool that gives you the insight you are looking for in no time. 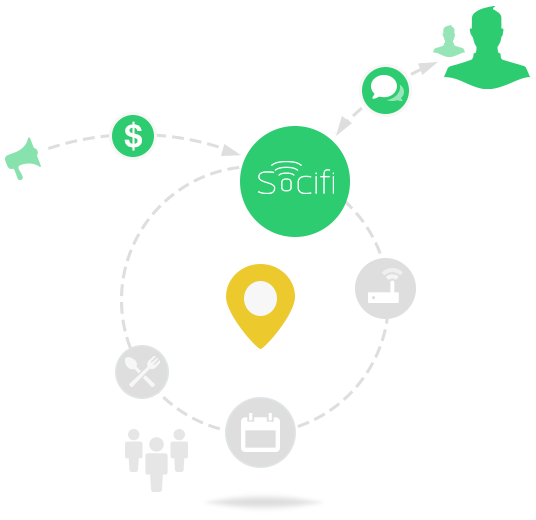 SOCIFI solution is ready when you are to drive your business and improve the user experice of your Wi-Fi. Take the control of your network, use features such as bandwidth limitin, user access, Social Wi-Fi, SMS Authentication, In-Session, Premium Access and many others. Convert unknown visitors into known customers. Collect valuable insights, analyze them & sync user data into popular systems such as Salesforce and others. 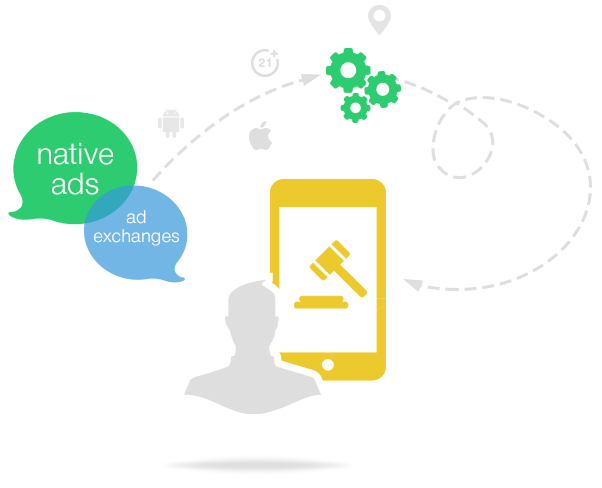 Open your network and offer this new media space to advertisers and nearby businesses. Make money thanks to SOCIFI Media Network. In no time. 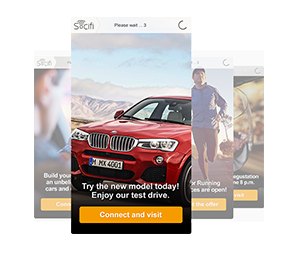 Premium Ads are served on Captive Portal before the visitor connects to the internet. Full-screen, guarenteed delivery and 100% share of voice. This allows you to engage the consumers during Internet session. The content is inserted into the web pages. Offer Premium (Pay-As-You-Go) Internet access on your Wi-Fi network. Visitors pay via credit card, through a secure payment gateway. We deliver WiFI Monetization and Wi-Fi Marketing tools that help you analyse your foot traffic, generate revenue and increase your brand awareness. Out of the box solution ready to serve. We provide you with the tools you need to earn additional revenue for your Wi-Fi. With SOCIFI cutting-edge technology, you set the floor price and advertisers bid on your inventory. Turn your Wi-Fi in a virtual ATM. We have all the experience you can use with analysing your visitors foot traffic. Get more insights about your prime hours, popular routes, average visit time and many others. Measuring and understanding your customers has never been easier. Use our incredible high-scalable cloud-based solution running on AWS and Microsoft Azure cloud in no time. Do you operate specific environment such as subway or are you located in the country with cloud regulations? Use our on-premise solution. 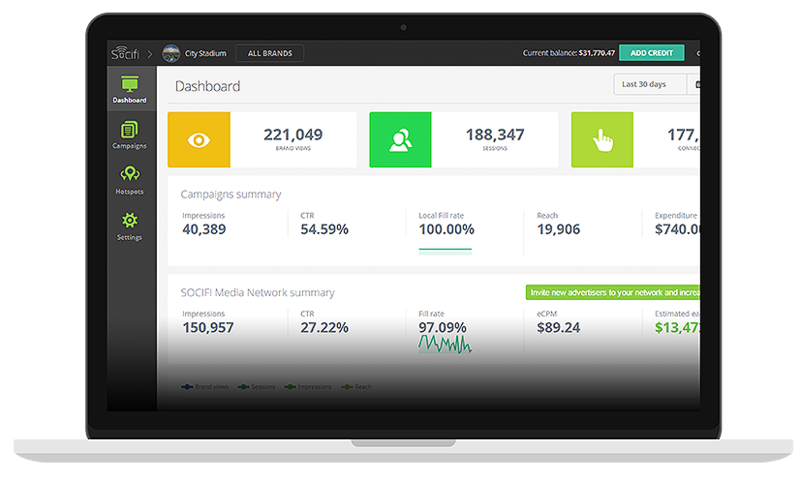 Easy-to-use cloud-based SOCIFI platform helps you and your advertisers create and manage ad campaigns. Just select Ad Format, upload the creative, define the targeting parameters and within a few clicks you are all set. It’s up to you to set the ratio between displaying your news, entertainment & third-party ad campaigns that generate you the new income. Monetization is accomplished with a native mobile application. It is pre-loaded or the customer is provided with a link to download it on their device. From where advertisers come from? With SOCIFI cutting-edge technology, you set the floor price and advertisers bid on your inventory. Secure very own & global advertisers and turn your Wi-Fi in a virtual ATM. Only local tenants or advertisers that are invited and approved by the publisher are able to advertise at venue’s WiFi. 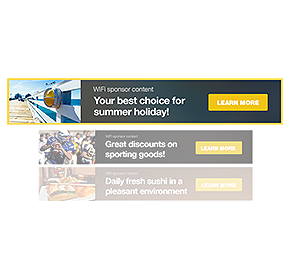 Ad campaigns are provided by the 3rd party advertisers at SOCIFI Media Network. Ad Exchanges are a digital marketplaces that enables advertisers to buy advertising space, often through real-time auctions. Use a bandwidth cap, also known as a band cap to limit data over a period of time. Use many of authentication methods from simple click-thru over social media (Social WiFi) to badge ID. SOCIFI is fully responsible solution and supports Phones, Tablets, Laptops & Personal Computers. Allow your users to sign on via SMS Authentication codes that can be used to track them, should they abuse the network. The RADIUS servers are located in our network across all regions hosted by AWS & Microsoft Azure. SOCIFI Dashboard manages all your access points, Premium (Pay-As-You-Go) Internet Access, Payment Gateway, Authentication & Authorization, Data Mining and all necessary Reports and Insights you might need. All data can be retrieved from SOCIFI Dashboard thru a standard CSV file or automatically thru REST API SOCIFI offers for communication & synchronization in real-time.